Kids 12 and under—always free! 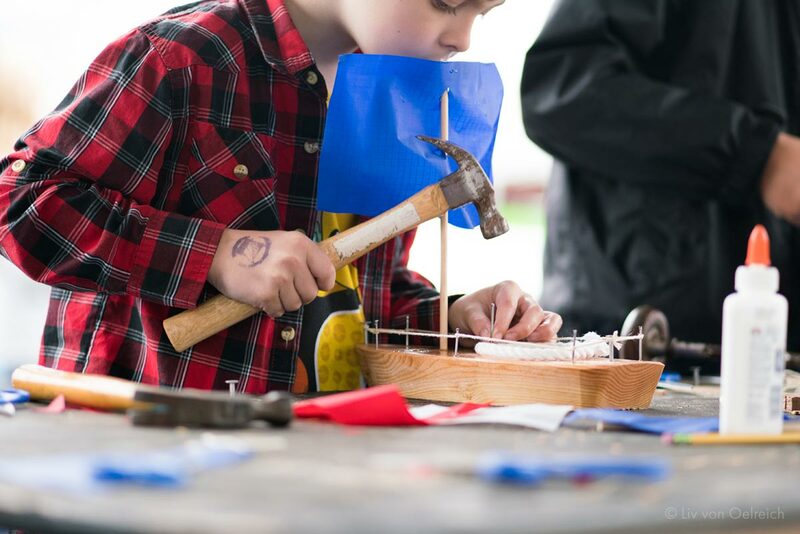 The Wooden Boat Festival is a place for kids of all ages to find their next big adventure! 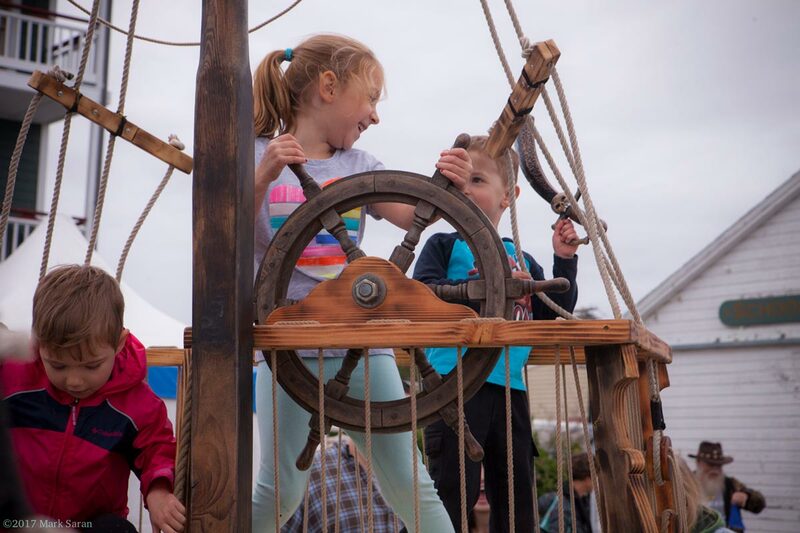 It’s a festival for whole family… Build a wooden boat, tour the harbor, explore the tall ships, paddle a SUP, row a rowboat, see the plays, sing sea chanteys, dance to the live music at the main stage, go on a pirate treasure hunt, and more—kids love the Wooden Boat Festival! A perennial favorite and right of passage for all kids! 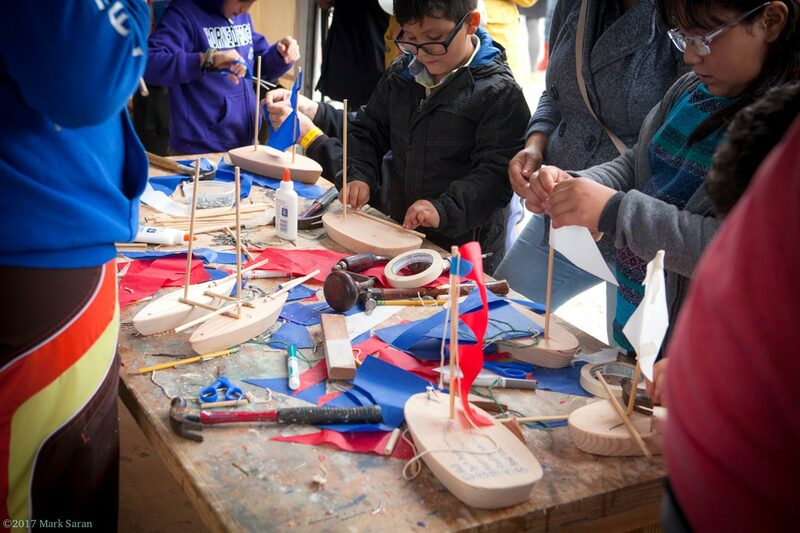 Kids of all ages can design, build, rig and sail away with their own small wooden boat. Select a hull, a mast, some sailcloth, and before you know it, life slows down while you help hold a nail, and share the joy of building a boat! Then take the boat to the water to enjoy the sweetness of kids playing with boats on the water. 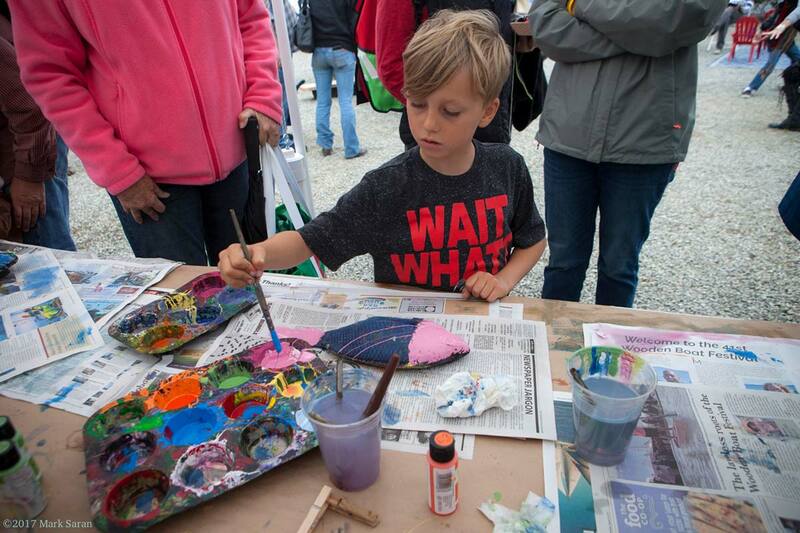 Paint t-shirts with fish in Kids’ Cove! Gyotaku is the traditional Japanese method of printing fish, a practice which dates back to the mid-1800s and was used by fishermen to record their catches. We use real fish to paint and make impressions on a t-shirt. Kids of all ages love Gyotaku. T-shirts cost 4$ and printing is free! Hang your shirt up to dry while you tour festival, then stop on your way out to pick it up! The “Bon Voyage! Passport to Adventure” Scavenger Hunt! Join us for the Bon Voyage! Passport to Adventure Scavenger Hunt, sponsored by Washington State University Extension and the Jefferson County Marine Resource Committee. “Passports” can be picked up at the WSU Extension/Marine Resources Committee tables, located at the head of the Point Hudson Marina on Friday and Saturday until 4 PM. Then ‘travel’ to specified Festival locations, learn something about the marine environment, and collect a stamp for your passport. Visit all 8 sites and return to your starting point to collect a prize! It’s fun for the whole family, and an interactive way to learn more about what you can do to take care of our marine waters! At high noon on Sunday, young pirates from near and far make their way to the Jolly Roger Flag at the Cupola House. Anyone dressed like a pirate can join the hunt, scouring the grounds and beaches for the “X” that marks the spot of buried treasure. Sunday from noon–1 PM. Come see Captain Cloud’s Latest Adventure – another long-time Festival favorite. This short play will engage kids of all ages, and often encourages enthusiastic audience participation! Come sit on the hay bales and enjoy the hilarious, family-friendly play. Located behind Artist Row on the way to The Point. All ages can try out a paddleboard in the paddleboard pool on the Point. This is great for those who have never been on a paddleboard before. Sign up at the pool. A classic Festival experience – Journey back in time aboard replicas of Captain George Vancouver’s boats from 1792. Work together as a crew to row and sail aboard these 26’ open boats with 8 rowing stations. Ages 12 and up. Signups start at 9 AM each morning at the longboat dock in the northeast corner of the marina. These free rides are very popular—sign up early! Signups start at 9 AM for morning rides and noon for afternoon rides. This is a great way to get out on the water and see the Festival. Sign up at the Free Rides Booth on the Commons in front of the NWMC. Join with other song lovers for an evening of singing sea shanties! Held both Friday and Saturday nights in the Marina Room (on the way to The Point), the singing starts at 7 pm. No experience is necessary to join the fun – experienced song leaders will have the whole group singing along to rousing age-old sea shanties in no time! Music is a big part of the Festival experience, and the Main Stage in Bar Harbor offers live music all day, every day! Enjoy everything from sea shanties to rock n’ roll, and everything in between. Children are welcome in the all-ages section, where there’s always plenty of room to dance! 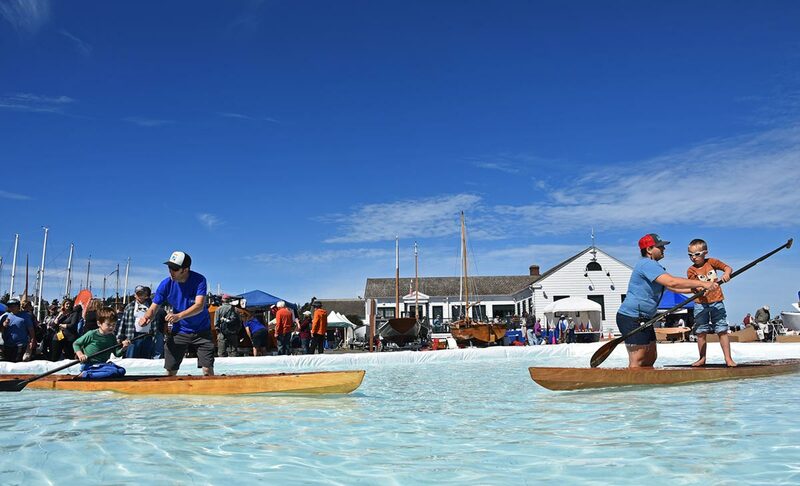 The Wooden Boat Festival is a part of the Northwest Maritime Center, whose mission is to engage and educate people of all generations in traditional and contemporary maritime life, in a spirit of adventure and discovery.